Charlie Gard is currently on life support in a London hospital. Courts have ruled in the hospital's favor to discontinue life support. 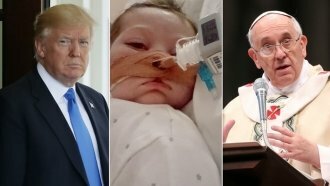 A Vatican hospital has offered to take in 11-month-old Charlie Gard. But it seems unlikely — at least at this point — that the British infant will be transferred there. Earlier this week, the Bambino Gesù hospital said it would welcome the boy if his parents want him transferred there. Gard has a mitochondrial depletion syndrome and is currently on life support. But the BBC reports U.K. foreign secretary Boris Johnson told his Italian counterpart that the child couldn't be transferred due to "legal reasons." The Washington Post, citing an unnamed Bambino Gesù hospital spokesperson, says the London hospital declined its offer. But the Post reports they're trying to iron out "a solution." The London hospital treating Gard wants to remove him from life support. Gard's parents have raised over 1.3 million British pounds for an experimental treatment in the U.S. The courts have ruled in the hospital's favor, saying it's unlikely the treatment would lead to any changes in Gard's condition and could cause him more harm. The Italian hospital's offer came after Pope Francis expressed his support for Gard and his parents. President Donald Trump has also offered to help Gard.